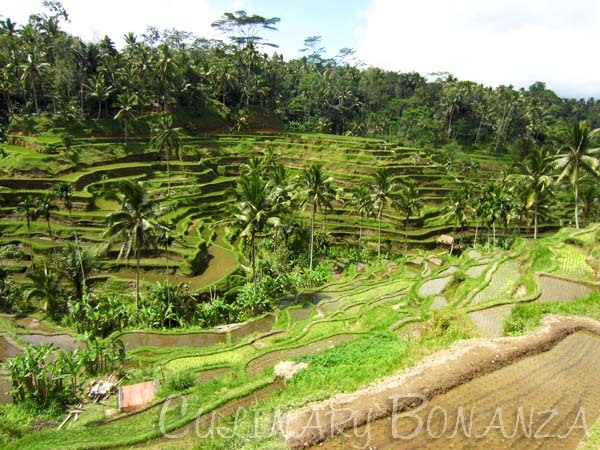 Let us now venture deeper into Bali island, and the next stop is Ubud, about 45 - 60 minutes drive from Kuta, where I stayed. Time is estimated based on a traffic-less day. Terraced Paddy field at Desa Cekingan, Tegallalang. Compared to the overcrowded Kuta or Legian areas down south, Ubud seems to have a more laid-back feel and it still retains its rural roots well. Don't be mistaken though, the so-called downtown of Ubud (along Jalan Monkey Forest and Jalan Hanoman) is marked with rows of shops selling anything you can imagine from the standard Balinese fashion, incense, minimarkets, Italian Gelato, you name it! 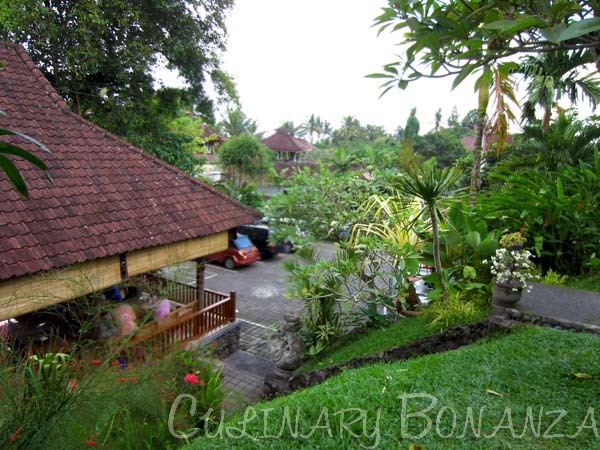 At the heart of downtown Ubud lies Puri Saren Ubud (Ubud Palace), home to the King of Ubud. Right across from the Puri is Ubud Tradisional Art Market, which is a maze of traditional market selling knick-knacks, mostly souvenirs and artsy merchandise for tourists. It is a massive complex, in which a narrow pedestrian lane snake through the throng of tourists and eager sellers. This market s comparable to the Russian Market in Phnom Penh, Cambodia, but not as sprawling as Chatuchak Market in Bangkok, Thailand. So, after visiting the beautifully-terraced paddy fields uphill and paying homage our distant "relatives" at the Monkey Forest (LOL! ), we went to Warung Mina for afternoon refuelling. 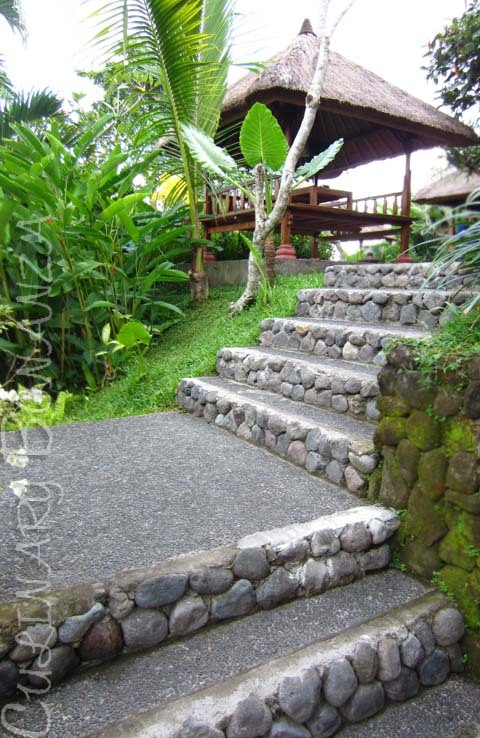 Perched atop a sloping hill, Warung Mina is a lovely escape from the teeming downtown Ubud. I particularly like the bale-bale at the top of the slope, where we could see the green picturesque sights down below, and enjoy the fresh and clean air. 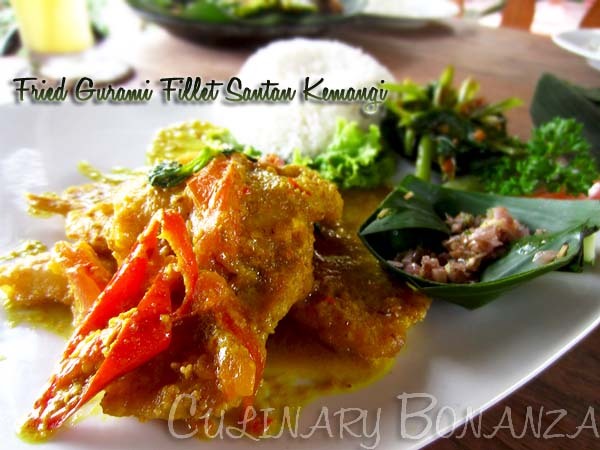 Since Warung Mina claims to offer "Masakan Ikan Segar" (fresh fish dishes), I decided to go for the Gurame fillet with Santan Kemangi, one of Warung Mina's signature dish. 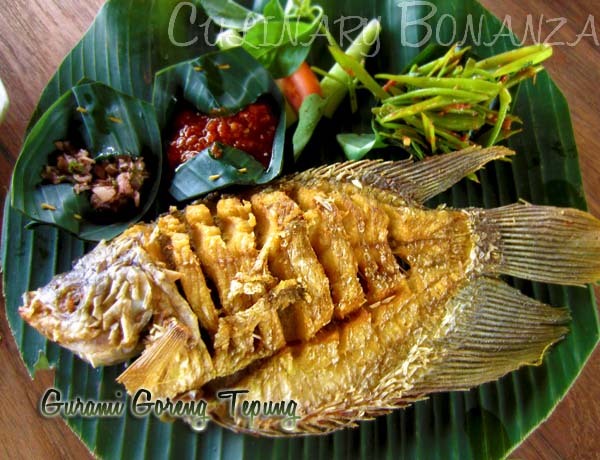 This is fried gourami fillet cooked in thick coconut-milk and kemangi leaves (lemon basil) to result in the citrusy scent. I was quite disappointed with this dish because I had to be cautious when eating the gourami fillet, as it was not thoroughly de-boned. The fish didn't taste that fresh either, although it didn't have the earthy smell that some gouramis do, must have been the lemon basil. The gravy was passable, but not memorable. 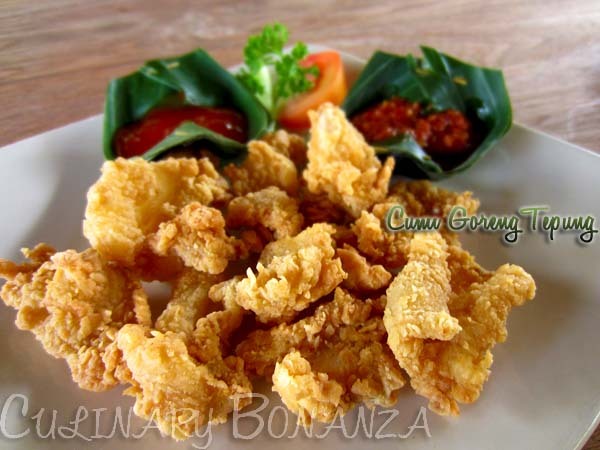 Besides seafood, Warung Mina serves other classic Indonesian dishes as well, like Chicken Satay, Ayam Goreng, Nasi Goreng, etc. To my surpsrise, there's one page on the menu that looks totally out of place in a traditional Indonesian restaurant like this. Pizza Mina! Now, would you order pizza when eating at warung? I personally won't.